Tweet Following on from the digital rain tutorial that I posted last week, I thought I'd share a short process for how I drastically altered a stock image. 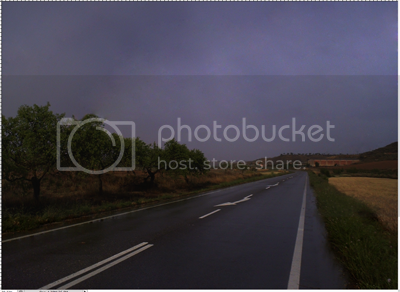 I started off with an image of a road and a rainbow from Sxc.hu. 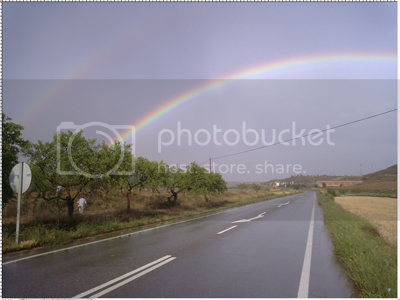 Then I removed the rainbow, cloned out the people on the left hand side, cropped the image to remove the sign to the left, and darkened the whole image using both Levels and the Brightness/Contrast function as adjustment layers. Next I added storm clouds from another stock image, this time on a new layer set to 'Multiply'. 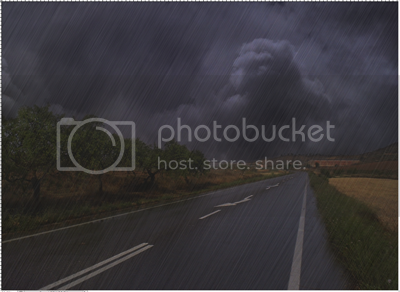 Then I added my first layer of digital rain. And another, this time set to 'Multiply. And finally, a dark vignette around the edges!